Sterling Children's Books, 9781454932208, 48pp. When Wu Chien Shiung was born in China 100 years ago, girls did not attend school; no one considered them as smart as boys. But her parents felt differently. Naming their daughter "Courageous Hero," they encouraged her love of learning and science. 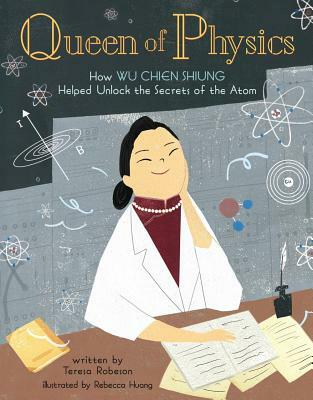 This engaging biography follows Wu Chien Shiung as she battles sexism at home and racism in the United States to become what Newsweek magazine called the "Queen of Physics" for her work on how atoms split. Along the way, she earned the admiration of famous scientists like Enrico Fermi and Robert Oppenheimer and became the first woman hired as an instructor by Princeton University, the first woman elected President of the American Physical Society, the first scientist to have an asteroid named after her when she was still alive, and many other honors. Teresa Robeson was born in Hong Kong, raised in Canada, and now writes and creates from her mini-homestead in southern Indiana where she lives with her scientist husband. A nonfiction winner of the We Need Diverse Books Mentorship Program, Teresa advocates for greater scientific and cultural literacy. Visit her online at teresarobeson.com and on Twitter @TeresaRobeson. Rebecca Huang is an illustrator from Taiwan who currently lives in the Bay Area. Rebecca received her MFA degree in illustration from Academy of Art University in San Francisco. She is the author and illustrator of Bobo and the New Baby. You can visit her at rebeccamhuang.com.